BELacoustics developed some new products with a luxurious finish in 100% wool felt for the prestigious project Residence Palace of Samyn and Partners. Within this project we came very many different challenges. So are all the walls curved because the building around is of form, what the design of a system wall not dealerships. In addition, all ceilings in a patchwork of 62 different colors, all color! The acoustic requirements within this project were very strict, but in the end, we managed to provide a suitable product fully to develop custom. After more than 2 years of study and tests, together with the architect, we developed some very high quality and aesthetically pleasing products. 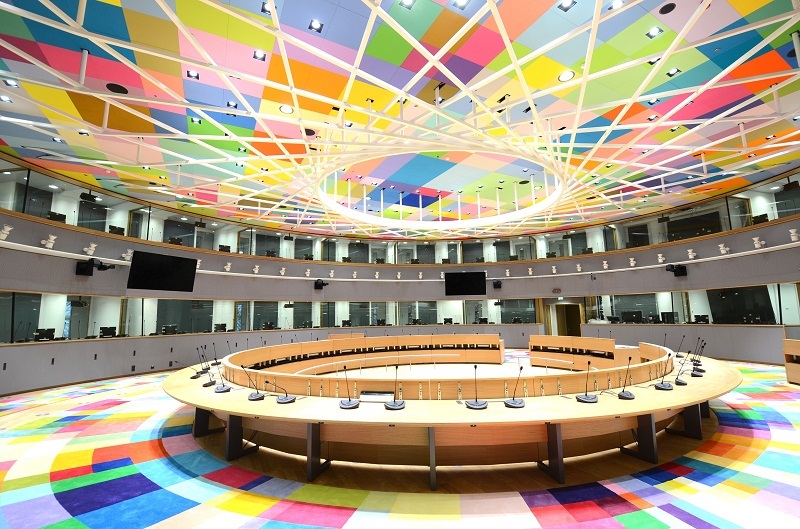 At the end of March 2014, in this new building for the European Council, we began the implementation of a 10,000 m² ceiling, and 4,000 m² of walls. The result is an impressive example of customization and acoustic perfection. Over the last few years, the popularity of felt has been growing rapidly. BELacoustics has developed some new products with a luxurious finish in wool felt. We work with 100% wool felt, which is selected extremely carefully and offered in a range of 65 colors.